Anny is one of the grown children from the Las Palmas children’s village. Your support of Anny through the years has made a tremendous impact on her life. You’ll be pleased to know that she has been paying your generosity forward through a life of service. Here’s her story and an update on what she is accomplishing now. Many years ago, Anny came to the Las Palmas children village as a small, orphaned child. Anny’s sick and aging grandmother was unable to care for her and eventually Anny became a part of the Las Palmas family. She had no one in the world to care for her — except you and ICC. Through the support of generous donors like you, Anny was given a new home and family. Anny grew to be well-respected within the Las Palmas community. She was cooperative at home, excelled in school and grew to love Jesus as her personal Savior. She thrived in the environment you helped provide for her. While growing up, Anny depended on you. And what a blessing you’ve been to help her not only through primary school and secondary school, but also when it was time to go to university. Your support made it possible for her, because when Anny and the other children turn 18, they don’t “age out” of our program. Anny wasn’t turned out into the streets. Your gifts and support make it possible for children like Anny to pursue an education that prepares them for a life of service. Your incredible generosity completely changed the trajectory of her life! What a blessing you’ve been! And even though Anny can’t pay you back for your support, she and many other ICC kids do pay your generosity forward by using their talents to serve others. Anny attended the Adventist University near the Las Palmas campus. She excelled in math and when her class schedule allowed, she returned to Las Palmas to help teach math to her “brothers and sisters.” In 2004 Anny earned degrees in Math and Accounting. What would she do next? How would she pay your generosity forward? You’ll be pleased to know that Anny accepted a position as math teacher at our Las Palmas primary school! The children loved Anny. She was an excellent teacher and she had a simple way of explaining math so that the children understood. While a teacher at Las Palmas, Anny married a handsome young man named Samuel. 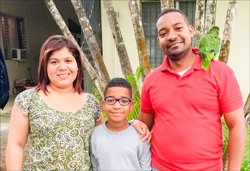 After some time, Anny and Samuel had the joy of welcoming their son, Adriel, into their home. The awareness of Anny’s skill as a math teacher spread beyond the Las Palmas campus. Eventually, the Adventist University asked her to join their staff as a math teacher. She accepted the position and during her time there, she earned her master’s degree in teaching. Anny’s influence has expanded beyond the small Adventist Community surrounding Las Palmas and the Adventist University. She is currently serving as Director of Accounting for the food service department for area schools and government offices. Though Anny’s sphere is influence has grown, her roots are still firmly planted within the Las Palmas family. Her son, Adriel is in 4th grade at the Las Palmas school. Her family continues to be members of the Las Palmas church were her husband, Samuel, serves as the church treasurer. Thank you for all you do to support orphans like Anny. You helped transform a life filled with heartache and tragedy into a life of service and influence! You make stories like this possible when you give your gift each month in support of other children who, like Anny, just need an opportunity to be loved within a caring family at an ICC children’s village. Thanks for all you do. God bless you. International Children's Care is a 501(c)(3) non-profit organization headquartered in Vancouver, Washington, USA. We can be reached by phone at 800.422.7729 between 8 am and 5 pm Pacific Time. Our address is: 2711 NE 134th Way, Vancouver, WA. 98986. Our general email address is: info@forhiskids.org.